After marriage equality passed in 2015, anti-LGBTQ forces zeroed in on trans people and worked relentlessly to dehumanize them. After the Supreme Court ruled in favor of marriage equality in June 2015, it seemed the U.S. was heading in a positive direction for LGBTQ rights. In an unexpected and horrendous turn of events, the following years took two steps back from the progress made. 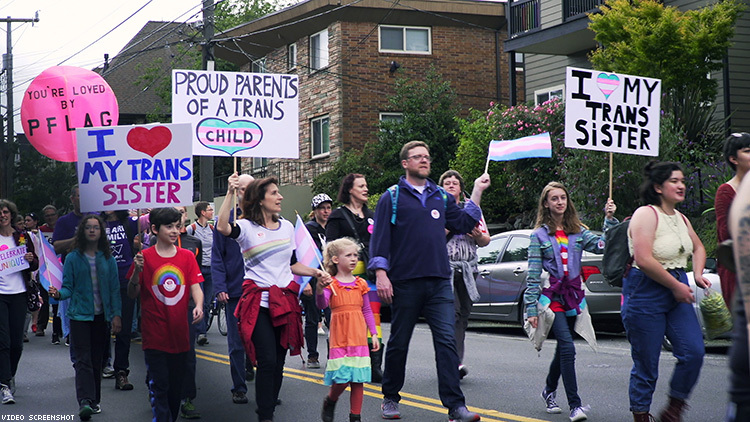 In 2016, 175 new anti-LGBT bills were introduced, with 44 specifically targeting the trans community in what were commonly known as “bathroom bills.” Vlada Knowlton, documentarian and parent to a trans child, recognized the injustice across the nation and in her home state of Washington, where six anti-trans bills were introduced. The founder of Knowlton's trans parent support group encouraged her to document what the Human Rights Campaign would report as the most dangerous year for transgender Americans. One of the children featured was 12-year-old Ve. She’s a cheerleader and a photographer whose biggest supporters are her family. Her mom wants the world to know her transgender daughter is "not a threat" in bathrooms, contrary to what the legislation suggests. Watch a clip from their interview below. Learn more about upcoming screenings and where you can watch The Most Dangerous Year here.